Computer-socket manufacturing error: How much before it is clinically apparent? Abstract–The purpose of this research was to pursue quality standards for computer-manufacturing of prosthetic sockets for people with transtibial limb loss. Thirty-three duplicates of study participants– normally used sockets were fabricated using central fabrication facilities. Socket-manufacturing errors were compared with clinical assessments of socket fit. Of the 33 sockets tested, 23 were deemed clinically to need modification. 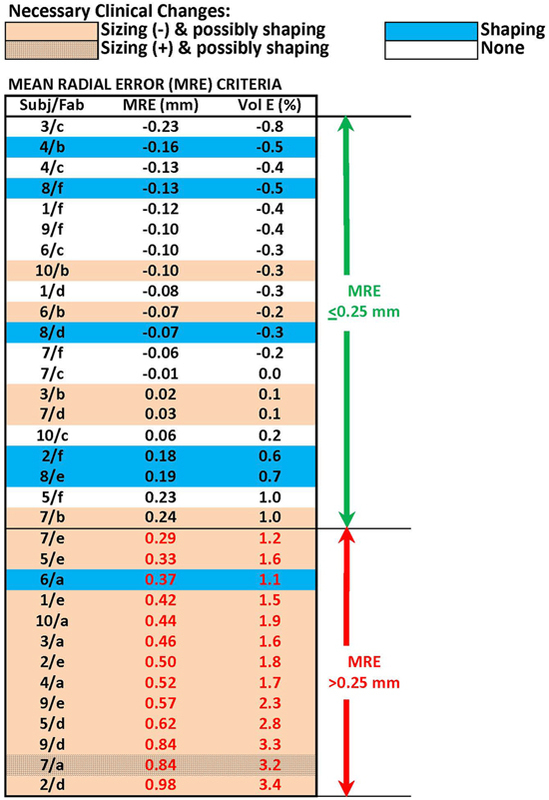 All 13 sockets with mean radial error (MRE) greater than 0.25 mm were clinically unacceptable, and 11 of those were deemed in need of sizing reduction. Of the remaining 20 sockets, 5 sockets with interquartile range (IQR) greater than 0.40 mm were deemed globally or regionally oversized and in need of modification. 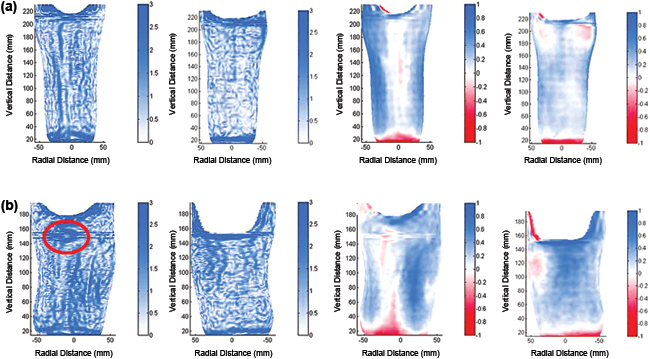 Of the remaining 15 sockets, 5 sockets with closed contours of elevated surface normal angle error (SNAE) were deemed clinically to need shape modification at those closed contour locations. The remaining 10 sockets were deemed clinically acceptable and not in need modification. MRE, IQR, and SNAE may serve as effective metrics to characterize quality of computer-manufactured prosthetic sockets, helping facilitate the development of quality standards for the socket manufacturing industry. Keywords: AAOP, alignment, amputee, CAD/CAM, central fabrication, prosthesis, radial error, socket rectification, socket shape, transtibial. Abbreviations: CAD/CAM = computer-aided design/computer-aided manufacturing, IQR = interquartile range, MFCL = Medicare Functional Classification Level, MRE = mean radial error, RVDT = rotational variable differential transformer, SD = standard deviation, SNAE = surface normal angle error. In recent studies, we found considerable variability in the quality of prosthetic sockets fabricated by central fabrication facilities using computer-socket manufacturing methods [1–2]. Fabrication errors might not be identified by the practitioner until the socket is test-fit to the patient because errors are often hard to see by eye. These errors extend the fitting process because they confound clinical fitting. The prosthetist must correct errors both from faulty manufacturing and from incorrect socket design, and distinguishing between the two can be difficult. Further, if computer-socket manufacturing errors are inconsistent from one fabrication run to the next and the errors are substantial, a practitioner will have difficulty effectively optimizing the socket shape file. This problem might explain why there is a wide range in the number of sockets (1 to 5) reported necessary to achieve an acceptable fit in computer-socket design and manufacturing literature [3–6]. Particularly for young prosthetists, computer-socket manufacturing errors can add significant challenge to prosthetic design. The purpose of this research was to determine what magnitude of socket manufacturing error was clinically relevant and what magnitude was clinically undetectable and thus insignificant. This effort will help set manufacturing standards in the prosthetics industry. To accomplish this objective, we compared clinical assessments of socket fit by an experienced practitioner to computer-socket manufacturing errors measured with a shape-sensing instrument. We developed different computed metrics to identify different kinds of error (volume, shaping) and then evaluated how well these computed metrics matched clinical judgment. Human subject volunteers were included in this investigation if they had a transtibial amputation at least 12 months prior and were a limited community ambulator or more active (Medicare Functional Classification Level [MFCL] ≥ K2). Additionally, subjects needed to regularly use an acceptably fitting definitive prosthesis as deemed in clinical examination by the research practitioner. 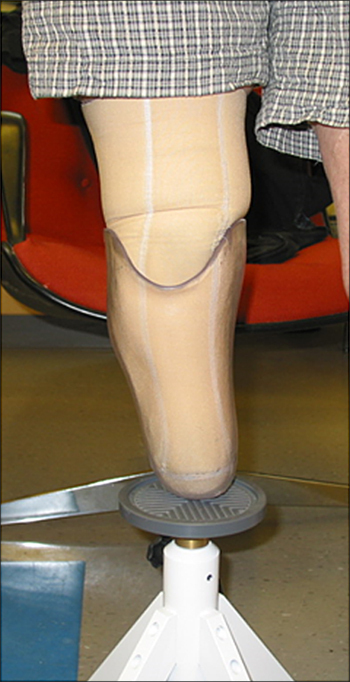 The prosthetic socket needed to fit properly with less than 10-ply sock thickness between the residual limb and socket. A sock thickness greater than 10 ply was considered indicative of a poorly fitting socket. Potential subjects were excluded from this investigation if they had skin breakdown or injury on their residual limb. We also excluded subjects with excessive diurnal residual-limb volume change, as evidenced by clinical exam and prosthetic history, because short-term limb volume changes might have confounded the clinical fit evaluations of interest in this study. We measured the shape of the inside of each subject–s regular prosthetic socket from the patellar tendon to as far distally as possible using a custom instrument described in detail elsewhere . The instrument was a very accurate mechanical digitizer that measured the position relative to a stable base of a low-friction sapphire ball (3.2 mm diameter) mounted to the tip of a spring-loaded stylus arm. The sapphire ball contacted the inside surface of the socket while the socket was rotated about its longitudinal axis using a stepper motor in the base (SM232AE-NGSN, Compumotor; Rohnert Park, California). After a cross-? ?section was digitized, the stylus arm was moved up using a linear slide rail (ETB32-B08PA99-HRB450L-A, Parker-Daedal; Columbus, Ohio), and the next cross-section was digitized. The angle of the stylus arm relative to the socket longitudinal axis was measured using a rotational variable differential transformer (RVDT) (R30A and ATA 2001, Schaevitz; Hampton, Virginia) mounted to the top of the stylus arm, and the stylus arm–s vertical position was measured using a linear differential transformer (BTL-5-A/C/E/G1-M457-R-S32, Balluff; Florence, Kentucky) within the linear slide rail. In postprocessing algorithms, we corrected for vertical translation of the stylus tip from rotation of the stylus arm about the RVDT axis. The instrument had a radial resolution better than 0.08 mm and measured socket volume differences less than 0.1 percent [1–2]. We measured each socket from the patellar tendon to the distal end at cross-sections spaced at 0.8 mm. A total of 800 points were measured in each cross-section at angular increments of 0.45??. It took approximately 6 h to digitize each socket shape. We used a different instrument to measure the shape of the prosthetic socket above the patellar tendon. After blocking the proximal anterior and posterior sections with tape, we positioned the socket in a commercial digitizer (d1, Provel; Cle Elum, Washington). The tape ensured that the stylus probe had continuous contact with the surface during digitization. Unlike our custom instrument, the Provel digitizer was able to digitize the upper socket effectively because the contact probe was large (a 2.0 cm diameter disk) and did not get stuck in the crevices between the socket and tape. The digitizer sampled at 120 points per slice at a 5.0 mm slice spacing. After digitizing the entire socket, we used our custom alignment algorithm, described here and in the Appendix (available online only), to align the shape measured with our custom instrument with the shape measured with the Provel digitizer. The sections common to both shapes were aligned. We then added the proximal socket section from the Provel digitizer to our scanner data to make a single electronic shape file for the entire socket. There was error in the proximal section measurement because the Provel digitizer, not intended for detailed investigation of socket shape differences but instead for capturing residual-limb cast shape as a starting point for socket design, was not as accurate as our custom shape measurement instrument. 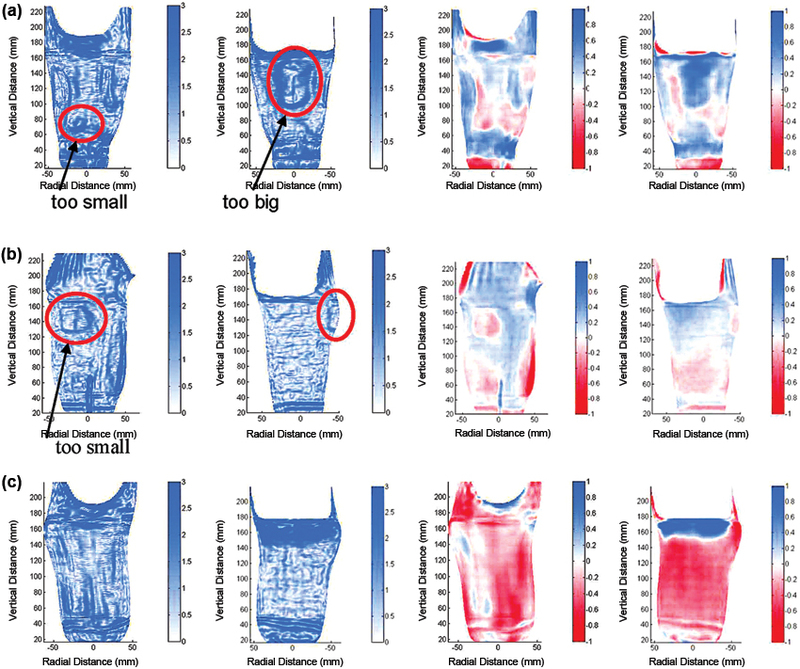 The effect of this error on shape analysis results needed to be considered. Using the data, we created an American Association of Orthotists and Prosthetists formatted file at 90 points per slice at a 0.8 mm spacing. The file was used for fabrication of test sockets. Six central fabrication facilities were contracted to make test sockets for the subjects. We selected the facilities from those tested in a prior investigation . Two groups of three facilities each were created. Each group contained one facility that previously demonstrated socket shapes well-matched to the electronic shape files and two that demonstrated moderately to poorly matched shapes. Each subject–s socket shape file was sent to each of the three facilities within a group, with assignment to the group randomly selected. Each facility made a clear check socket of glycol-modified polyethylene terephthalate material and returned it to us untrimmed at the brim. We measured the shape of each fabricated test socket using our custom instrument. Since the socket was untrimmed when we digitized the entire socket with our custom instrument, it was not necessary to use the Provel digitizer to measure the proximal aspect of the socket. After digitization, the research practitioner trimmed the socket and filed the brim using standard clinical procedures. After all three test sockets for a subject were prepared, the subject was scheduled for a test fitting session. Upon arriving at the research laboratory, the subject sat still for 10 min in a stable chair with the prosthesis on and the prosthetic foot supported by the floor. This procedure was performed to achieve a homeostatic condition before test fitting. The research practitioner, who had over 8 years of clinical experience as a certified prosthetist and over 11 years of research experience in prosthetics, queried the subject about medical and prosthesis history and determined whether changes had been made to the prosthesis since the socket shape was digitized. Any changes were recorded. The subject then removed the prosthesis, and the research practitioner inspected the residual limb for signs of breakdown or injury. If breakdown or injury was apparent, then the subject was released from the study and encouraged to visit his or her regular prosthetist for socket modification. If no breakdown or injury were noted, then the session continued and the subject, wearing the same liner and sock ply used with the regular prosthesis, donned the first test socket. Both the subject and the practitioner were blinded to the facility that manufactured each test socket, and there were no distinguishing features that identified any socket–s manufacturer. In each testing session, we randomized the order in which the sockets were tested. Test fitting of each socket proceeded in a manner similar to clinical static fitting . The subject was instructed to bear weight on the socket while it was supported by a fitting stool (Figure 1). The practitioner used putty balls inside the bottom of the socket to assess distal end bearing, a probe (corset stay) to identify pressure points between the residual limb and socket, verbal feedback from the subject to assess comfort and to identify problem areas, and visual inspection of skin color after doffing to assess tissue response. The practitioner documented whether there was a global sizing problem (i.e., socket too large or too small). If sock addition was deemed necessary, then socks were added one at a time (1-ply Soft Sock, Knit-Rite; Kansas City, Kansas). According to manufacturer documentation, the Soft Sock was 90.6 percent polyester, 5 percent X-STATIC (Noble Biomaterials Inc; Scranton, Pennsylvania), and 4.4 percent Lycra Spandex (Invista; Wichita, Kansas). X-STATIC is a proprietary silver-based antimicrobial material. Lycra Spandex is a synthetic fiber with high elasticity. The socks were new and were not worn at any time other than during the present study. 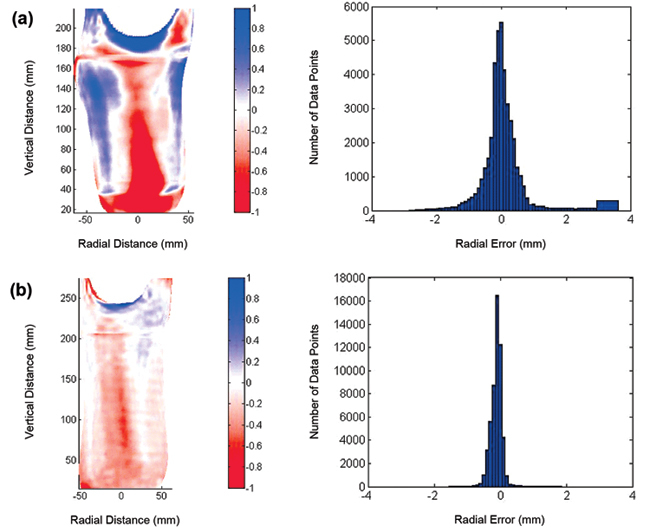 In a separate investigation, we determined that this sock model had a thickness of 0.45 mm (standard deviation [SD] = 0.03 mm) under loading conditions representative of standing with equal weight-bearing . If two or more 1-ply socks were added or if more than two 1-ply sock thickness was deemed necessary for just the proximal region or just the distal region, in other words if there was a regional socket volume problem, then the socket was considered oversized and was documented as having a –sizing and possibly shaping– problem. No further evaluation was conducted on the socket. The basis for this methodology was that in clinical practice oversizing of a new socket by two 1-ply socks would be, for a patient who does not undergo clinically significant diurnal volume change, clinically unacceptable and would require socket reduction before further test fitting. For sockets with 1 ply or no ply added, socket shape was carefully assessed, and the practitioner marked regions deemed too large or too small, if they existed, with blue (too large) and red (too small) marker on the external socket surface. The sockets were later photographed to document regions in need of shape modification. It took less than 5 min to assess each test socket fit. After evaluation of socket fit was completed, the subject doffed the test socket, donned his or her regular prosthesis, and stood with intermittent weight shifting for 2 min. The subject then sat down, doffed the regular prosthesis, and donned the second test socket. Fit was evaluated using the same test procedure. This test was followed by a 2 min stand with intermittent weight shifting wearing the regular prosthesis. The third test socket was then evaluated in a similar manner, followed by a 2 min stand with intermittent weight shifting wearing the regular prosthesis. All three sockets were then tested again using the same procedure and in the same order. Careful records were kept of the practitioner–s assessment and feedback from the subject. Clinical assessment of test sockets. During evaluation, subject stood bearing weight on fitting stool. To assess the shape quality of the computer-? ?manufactured sockets, we compared the test socket shapes with the original socket shapes for each subject. Methods for measuring the socket shapes are described previously. To align the shapes, we implemented an optimization procedure that involved minimizing the volume difference and maximizing the shape similarity. A detailed description of the alignment algorithm and the mathematical functions used in the optimization are provided in the Appendix (available online only). All socket shapes for a subject were aligned with the same optimization procedure to ensure they were of the same length. 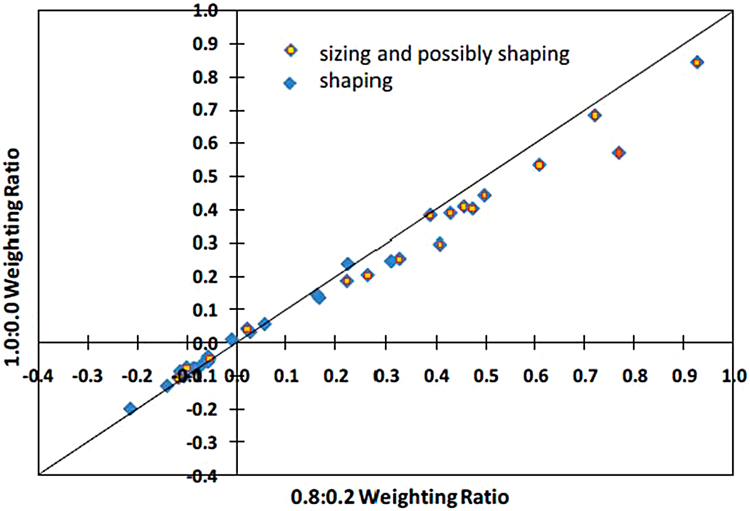 To assess sensitivity to weighting of the optimization criteria in the algorithm, we compared mean radial error (MRE) results using a 0.8:0.2 ratio of minimizing volume difference to maximizing shape similarity to results using a 1.0:0.0 ratio. Once the test socket shapes were aligned to the original socket shapes and the shapes were trimmed at the brim, we carried out three computational analyses. The analyses characterized the size and shape quality of the test sockets compared with the original sockets. The analysis proceeded in series in a manner similar to the clinical static fitting procedure described previously, assessing (1) overall socket volume error, (2) regional socket volume error, and (3) local socket shape error. The metrics we developed for each are described here. We determined the global volume error for each test socket by calculating the MRE between the test socket shape and the original socket shape. The MRE is the average radial difference between each point on the test socket compared with its corresponding point (on the same radial vector) on the original socket. We determined regional volume error by calculating the interquartile range (IQR) of radial error. 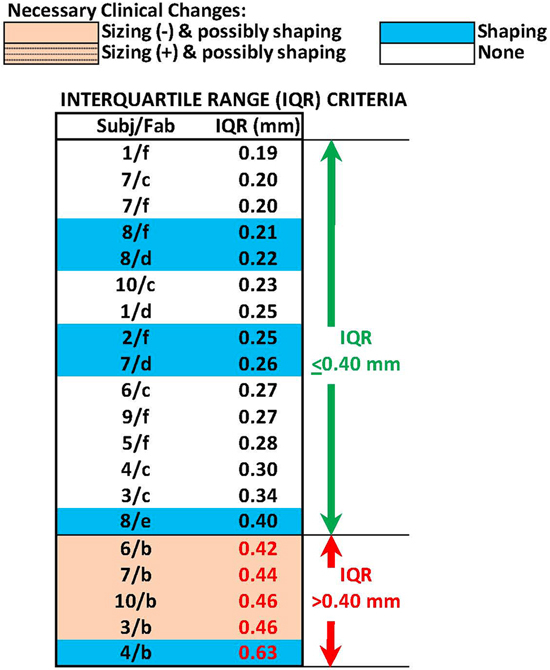 IQR is the range of radial error about the MRE between the test socket shape and the original socket shape for the 50 percent of the points on the surface that are closest to the MRE. Thus, a test socket with a large IQR has some regions on the socket that are grossly undersized and other regions that are grossly oversized, while a test socket with a small IQR has a small and relatively uniform error over the surface. We determined local socket shape error by calculating the mean surface normal angle error (SNAE) between the test socket shape and the original socket shape. SNAE is the angle difference between a line projecting outward normal from the test socket surface and a line projecting outward normal from the original socket surface, assuming the points are along the same radial vector directed outward perpendicular to the socket longitudinal axis (the longitudinal axis is the same for both sockets after executing the alignment algorithm described in the Appendix, available online only). Thus, the SNAE is a measure of local shape difference. The mean SNAE is the average SNAE of all points on the surface with all points equally weighted in the calculation. For each of the three metrics (MRE, IQR, mean SNAE), we investigated if there was a value that separated clinically acceptable sockets from clinically unacceptable sockets. Thus, we did not set values a priori for these metrics, but instead determined them based from inspection of the data. A total of 11 subjects with unilateral transtibial amputation participated in this study. One subject–s socket was modified between the time we digitized the socket shape and the time we conducted test socket fitting. His data were excluded from the analysis described here. Of the remaining 10 subjects, 9 had their limb amputation as a result of traumatic injury and 1 from spina bifida. Residual-limb length from the midpatellar tendon to the distal end of the tibia averaged 15.7 cm (SD = 3.5 cm). Time since amputation ranged from 1.3 to 68.5 years with a mean of 18.1 years (SD = 20.4 yr). Seven subjects were male and three were female. Six were K3 level ambulators and four were K4 level ambulators, as defined by MFCL criteria . Subject mass averaged 80.3 kg (SD = 16.2 kg), and body mass index (subject wearing prosthesis) averaged 25.5 (SD = 4.7). 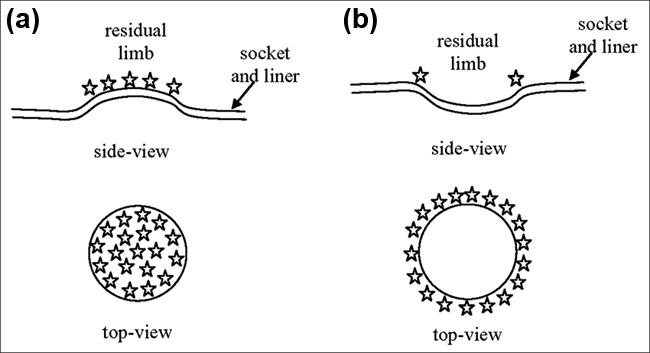 Seven subjects used an elastomeric liner with locking pin, one used an elastomeric liner with a suction socket (no pin), one used a Pelite liner with sleeve suspension, and one used a gel-impregnated sock with sleeve suspension. Sock ply use ranged from 0 to 6 ply and averaged 3.7 ?? 2.2 ply. Time since the regular prosthetic socket was made averaged 2.0 years (SD = 1.6 yr). All subjects used a dynamic response prosthetic foot. For 9 of the 10 subjects (all except subject 8), the time between when we digitized the subject–s regular prosthetic socket and when we conducted clinical evaluations of the test socket fits averaged 66 days (SD = 28 d) and ranged from 17 to 98 days. Subject 8 was assessed 259 days after the socket shape was digitized. Subject 8 was tested later than other subjects because of scheduling issues and health problems. Despite the long time interval, subject 8–s normally-used socket fit, like that of the other nine subjects, was deemed acceptable at the time of clinical test socket fitting. We found it essential that, before starting test socket evaluation, the patient sit for 10 min with the normally used prosthesis donned and the foot supported by the floor. If the subject removed the regular prosthesis sooner, then the first evaluation of the first socket tended to reflect an enlarged residual limb compared with the second evaluation of the same socket. Results were identical for pairs of evaluations for the second and third sockets tested in a session. We suspect that the activity of walking to the laboratory and the elevated blood pressure and vascular flow it induced in the residual limb caused this difference for the first socket (if the subject did not first sit quietly for 10 min). A total of 33 sockets were tested, 3 by each subject except subject 7, who tested 6 sockets (one from each central fabrication facility). Of the 33 sockets, 16 were deemed to need sizing and possibly shaping changes, 7 were deemed to need only shaping changes, and 10 were deemed to need no changes. 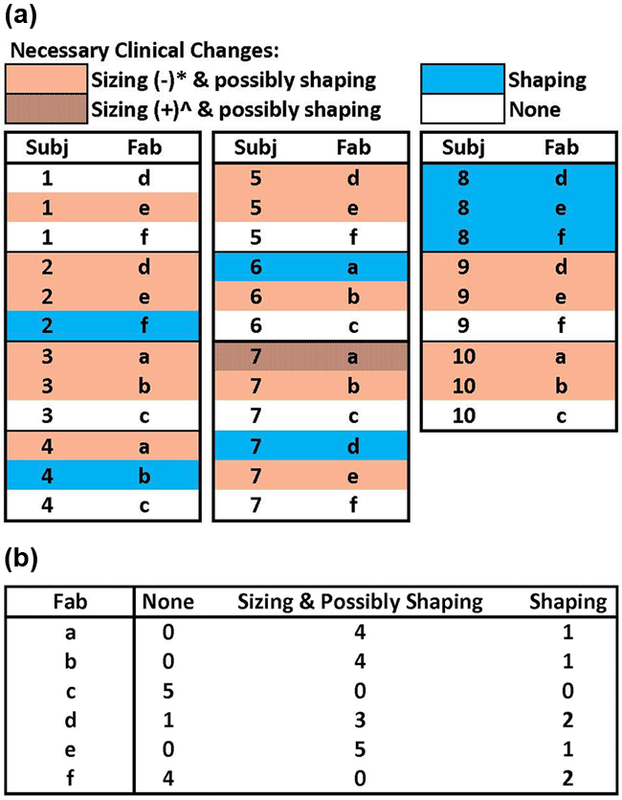 The need for change and the nature (sizing, shaping) were distributed among the subjects and central fabrication facilities as shown in Figure 2(a). Only one subject, subject 8, needed the same type of modification (shape only) to all three sockets. Fabrication facilities c and f had fewer sockets deemed in need of sizing or shaping changes than the other central fabrication facilities (Figure 2(b)). Facilities c and f demonstrated socket shapes strongly matched to electronic file shapes in a previous investigation . Results from clinical test fitting grouped by (a) subject and (b) by central fabrication facility. *Socket was too large and needed to be reduced. ^Socket was too small and needed to be enlarged. Fab = fabrication facility, Subj = subject. We integrated computed shape evaluation results (MRE, percent volume error) into a graphic with the clinical evaluations (Figure 3) and ordered the sockets from smallest to largest MRE. Sockets in need of sizing and possibly shaping change tended to group toward the bottom of the table. Of the 13 sockets with MRE over 0.25 mm, 12 needed sizing and possibly shaping changes and 1 needed just a shaping change. There were no sockets with an MRE greater than 0.25 mm that did not need modification. Based on the strong match between the MRE computations and clinical fitting (bottom section of Figure 3), we selected an MRE value of 0.25 mm as an appropriate computed delineator between oversized and not oversized sockets. An MRE of 0.25 mm corresponded to a socket volume error of approximately 1.0 percent. Of the 12 sockets that needed sizing and possibly shaping change, 11 required reduction, consistent with their positive MRE values (indicating oversizing) (Figure 4(a)), while one required enlargement, inconsistent with its positive MRE value. The one requiring enlargement was oversized over most of its surface, except for a 15 mm diameter region over the anterior distal tibia that was undersized by approximately 0.7 mm (Figure 4(b)). Sockets with an MRE ≤ 0.25 mm but deemed clinically in need of sizing and possibly shaping changes tended to be grossly oversized in some areas but grossly undersized in others, as shown in Figure 4(c). Mean radial error (MRE) and percentage volume error results. All 33 sockets ranked in order of lowest to highest MRE. Socket volume errors (Vol E) are expressed in percentage volume of subject–s normally used socket with brim trimmed. Fab = fabrication facility, Subj = subject. Example radial error results. (a) Socket with mean radial error (MRE) > 0.25 mm clinically deemed in need of reduction and possibly shaping change (2/e). (b) Socket with MRE > 0.25 mm clinically deemed in need of enlargement and possibly shaping change (7/a). (c) Socket with MRE ≤ 0.25 mm deemed in need of sizing and possibly shaping change (10/b). x- and y-axes are radial and vertical distances, respectively, in mm. Scale range is -1.0 mm to +1.0 mm. When a different algorithm that minimized only radial error (weighting ratio 1.0:0.0) and not both radial error and SNAE (weighting ratio 0.8:0.2) was used to align socket shapes, the calculated MREs were reduced, but not in equal proportion for all sockets (Figure 5). The ordering of sockets from lowest to highest MRE changed for eight of the sockets, and one socket shifted from the unacceptable to acceptable category. The weighting ratio used to generate the results presented in Figure 2(a) and (b); Figure 3; and Figure 4(a), (b), and (c) (0.8:0.2) was used in all subsequent analysis. Mean radial error (MRE) results using different weighting ratios in socket alignment optimization algorithm. MRE results with 1.0:0.0 ratio are compared with results with 0.8:0.2 ratio. Using our selected delineation of an MRE of 0.25 mm, the 13 sockets with an MRE > 0.25 mm were considered well-characterized (all were deemed in need of sizing or shaping change) and were not considered in further analysis. In clinical practice, a test socket deemed too large (≥ two 1-ply sock additions) would typically not be further inspected but instead would be reduced, and a new socket would be made and test fit to the patient. We considered identifying a separate delineator for undersized sockets. However, there were not enough sockets deemed undersized to establish a computed delineator for undersizing. We continued analysis of the 20 sockets with MRE ≤ 0.25 mm. These sockets were ordered from smallest to largest IQR (Figure 6). Sockets in need of sizing and possibly shaping change tended to group toward the bottom of the table. Four of the five sockets with IQR > 0.40 mm needed sizing and possibly shaping change, while one needed shaping change exclusively. All five sockets with IQR > 0.40 mm were fabricated by the same facility (b). All of these sockets suffered from regional volume distortions in load-bearing regions, as shown in Figures 2(c) and 7(a), unlike sockets with IQR ≤ 0.40 mm, which did not display this feature (Figure 7(b)).We also noted that the ? ?single socket deemed in need of only shaping change (6/a) in the bottom section of Figure 3 had an IQR of 0.51 mm. Thus, it would have been classified in the lower group within Figure 6 if it had not been eliminated earlier because its MRE was greater than 0.25 mm. Interquartile range (IQR) results. All 20 test sockets with mean radial error ≤ 0.25 mm are ranked in order of lowest to highest IQR. Fab = fabrication facility, Subj = subject. Example interquartile range (IQR) results. (a) Socket with mean radial error (MRE) ≤ 0.25 mm and IQR > 0.40 mm clinically deemed in need of sizing and possibly shaping change (3/b). (b) Socket with MRE ≤ 0.25 mm and IQR > 0.40 mm not in need of change (1/f). Image of radial error and histogram of radial error are shown for (a) and (b). Based on the match between the IQR computations and the clinical findings, we selected an IQR value of 0.40 mm as an appropriate computed delineator of acceptable regionally sized sockets from unacceptable regionally sized sockets. The five sockets with IQR > 0.40 mm were considered well-characterized and not considered in further analysis. 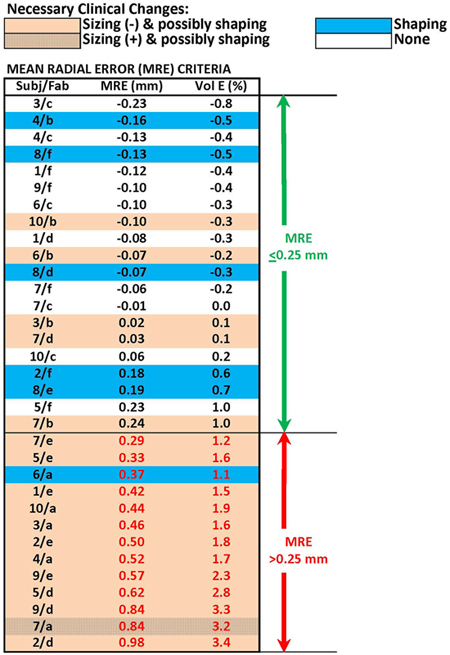 We continued analysis of the 15 sockets with MRE ≤ 0.25 mm and IQR ≤ 0.40 mm. These sockets were ordered from smallest to largest mean SNAE (Figure 8). Sockets in need of shaping modification tended to group toward the bottom of the table. Four of the eight sockets with mean SNAE greater than 4.0?? needed shaping change and four did not need change. One socket with mean SNAE ≤ 4.0?? needed shaping change and the remaining six with mean SNAE ≤ 4.0?? did not need any modification. Surface normal angle error results. (a) All 15 sockets with mean radial error ≤ 0.25 mm and interquartile range ≤ 0.40 mm are ranked from lowest to highest mean surface normal angle error (MSNAE). (b) Descriptions of surface normal angle distributions and their link with clinical recommendations. ant = anterior, dist = distal, Fab = fabrication facility, fib = fibular, lat = lateral, med = medial, post = posterior, prox = proximal, Subj = subject, tib = tibial. We inspected plots of SNAE distribution for the 15 sockets to explore why some sockets deemed clinically acceptable had high mean SNAE. Sockets with mean SNAE > 4.0?? 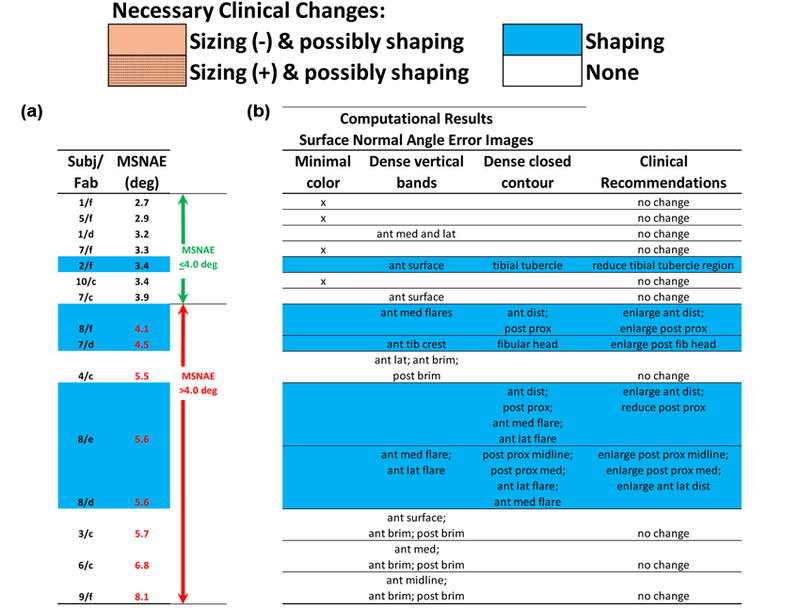 in need of modification (sockets highlighted blue in the lower part of Figure 8) tended to show dense closed contours in regions the practitioner identified clinically in need of modification (Figure 9(a) and (b)). For all sockets with mean SNAE > 4.0?? in need of modification, the closed contour regions well matched locations the practitioner deemed problematic, and the direction of radial error, visually apparent in plots of MRE (right two panels in Figures 9(a), (b), and (c) and 10(a) and (b)), was consistent with clinical assessment (Figure 8). In other words, socket locations the practitioner identified as in need of reduction were oversized (blue) in MRE plots. Socket locations the practitioner identified as in need of relief were undersized (red) in MRE plots. However, for sockets 8/d and 8/e, closed contours appeared on the flares that were not identified problematic by the research practitioner (Figure 8). Sockets with mean SNAE greater than 4.0?? not in need of modification (sockets in the lower part of Figure 8 and not highlighted) tended to have much error at the brim and linear bands of high SNAE elsewhere. They did not show closed contour regions (Figure 9(c)). Sockets with mean SNAE ≤ 4.0?? not in need of modification (sockets in the upper part of Figure 8 and not highlighted) showed low color densities (Figure 10(a)). The single socket with a mean SNAE < 4.0?? but in need of clinical modification (sockets highlighted in the upper part of Figure 8) showed a dense closed contour at the tibial tubercle, the site deemed clinically to need modification (Figure 10(b)). Thus, our observation was that regions with dense closed contours were clinically problematic, while a socket with no closed contours fit acceptably. Example surface normal angle error (SNAE) results: sockets with mean SNAEs greater than 4.0??. Left two panels show SNAEs (units are degrees), and right two panels show radial error (units are mm). All sockets had mean radial errors ≤ 0.25 mm and interquartile ranges ≤ 0.40 mm. (a) Socket clinically deemed in need of shaping change anterior distally and posterior proximally (8/e). Red circles highlight regions in need of shaping change. (b) Socket clinically deemed in need of shaping change at posterior aspect of fibular head (7/d). Red circles highlight regions in need of shaping change. (c) Socket clinically deemed not in need of modification (3/c). 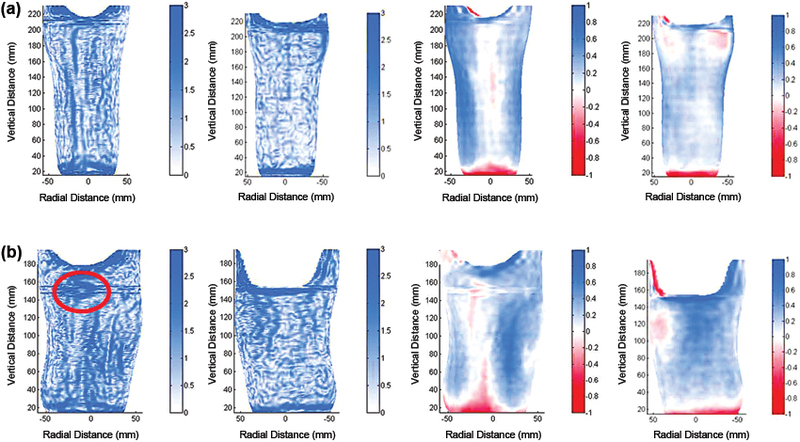 A comparison of plots of SNAE distribution (Figure 9(a) and (b), left panels) with plots of radial error distribution (Figure 9(a) and (b), right panels) showed that SNAEs tended to concentrate at locations of high change (gradient) in radial error. SNAE reflected the curvature mismatch at the boundary of the more oversized to the less oversized region, or the more undersized to the less undersized region. Example surface normal angle error (SNAE) results: sockets with mean SNAEs less than or equal to 4.0??. Left two panels show SNAEs (units are degrees), and right two panels show radial error (units are mm). All sockets had mean radial errors ≤ 0.25 mm and interquartile ranges ≤ 0.40 mm. (a) Socket clinically deemed not in need of change (5/f). (b) Socket clinically deemed in need of shaping change at tibial tubercle (2/f). Red circle highlights region in need of shaping change. Computed metrics that have clinical meaning empower the practitioner and the industry. The computed metrics developed here help to define how much computer-socket manufacturing error is allowable before it is clinically relevant to fit. The metrics may serve as tools for quantitative evaluation of manufactured socket quality. Sockets from different central fabrication facilities can be compared and, further, the same facility can test how different design variables affect quality. For example, the influence of different preform materials, carving speeds, or bit sizes on manufactured socket shape can all be tested. This insight should be useful to central fabrication facilities and their clients, and also to clinics using in-house computer-aided design/computer-aided manufacturing (CAD/CAM) who seek to optimize clinical outcome of their socket manufacturing practices. It would also be interesting to use these tools to compare thermoplastic and laminated sockets. Our assessment algorithm proceeded similar to clinical static-fitting assessment in that we first evaluated socket volume, then regional volume, and then local shape. This strategy well-identified error and simplified interpretation of computational results because it indicated the nature of the error. It is worth noting that, if we did not eliminate sockets with high global volume error and regional volume error (using the MRE and IQR criteria) before implementing the local shape assessment computation (surface normal error), then the strikingly strong relationship between SNAE pattern (closed contours of dense SNAE) and clinical fit assessment areas (in need of local shape adjustment) documented in Figure 8 would not have occurred for such a high percentage of the sockets. This result is analogous to clinical fitting in that a practitioner would be hard pressed to identify local shape errors in a socket that is grossly oversized. The stepwise process was essential. A limitation of the present investigation was that no subjects with dysvascular cause of amputation and no subjects who commonly experienced substantial diurnal volume change were included. 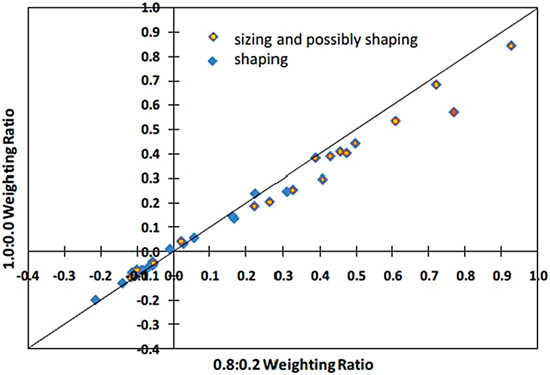 These subjects may be less tolerant to sizing and/or shaping error and thus might require different computational acceptability criteria than those determined in this study. Another limitation was that only one practitioner conducted the clinical evaluations of test socket fit. The practitioner had over 8 years of experience in clinical practice and 11 years of experience in prosthetics research, and so was able to make socket assessments with a high quality clinic care. However, the possibility remains that computational acceptability criteria may still be practitioner-dependent. Based on our experience in pilot studies with two other experienced practitioners, though, we believe differences in computational acceptability criteria for different practitioners will prove to be minimal. The lack of dynamic assessment, i.e., clinical inspection of socket fit during ambulation, was another limitation of the present investigation and might explain the socket 7/a result: a poor match between clinical assessment and computational findings (Figure 4(b)). Socket 7/a was deemed undersized clinically but oversized computationally with a regional shape error at the anterior distal end. This error likely would have been identified during dynamic assessment. Dynamic assessment might also have revealed that sockets with high mean SNAE but deemed clinically acceptable (high mean SNAE in Figure 8 but not highlighted) did need modification, though it is our opinion that those sockets were mischaracterized for a different reason (see –Interpretation of Surface Normal Angle Error Results– section). We arrived at a weighting ratio of 0.8:0.2 between radial weighting (–Radial Weight– section in Appendix, available online only) and normal weighting (–Normal Weight– section in Appendix, available online only) within the optimization routine by trying different ratios and assessing match with clinical assessment, both in pilot investigations of the present study and in prior investigations where we used this ratio [1–2]. The fact that results in the present study changed when minimization of radial difference was used exclusively in the alignment optimization routine (weighting ratio 1.0:0.0) indicates that our introduction of minimization of surface normal angle difference, which reflected shape similarity, affected how the sockets aligned. Our experience in other projects is that shapes without distinct and sharp contour changes need the shape similarity criteria (surface normal angle) within the alignment algorithm for them to align properly. Including surface normal angle improved delineation of the type of socket fabrication problem (sizing or shaping). In general, including surface normal angle optimization in the algorithm increased differences in MRE between the sockets tested (Figure 5). Because of errors at the brim introduced by using a different instrument to measure proximal regions of the sockets (see –Methods– section), we were not able to characterize the effect of weighting ratio on mean SNAE. This issue remains a topic of future investigation once the brim measurement problem is overcome. Companies that demonstrated the greatest percentage of acceptably fitting sockets also demonstrated socket shapes well-matched to electronic file shapes in our prior investigation . Therefore, we conclude that there is no inconsistency in quality in the entire CAD/CAM industry. Instead, some facilities consistently practice the art of socket fabrication better than others. The fact that sockets with large MRE were deemed clinically too large indicates that MRE was a good quantitative measure of volume error, serving well to identify what the practitioner detected clinically as an improperly sized socket. For the sockets tested in the present study, an MRE of 0.25 mm reflected approximately a 1.0 percent volume error. To put this volume in perspective, 0.25 mm is approximately half the thickness of a new 3-ply Soft Sock (Knit-Rite) while worn on a residual limb during walking . While half of a 3-ply sock may or may not affect socket comfort, this amount of oversizing at the time of new socket fitting is problematic. Clinical experience is that oversized sockets induce a greater diurnal limb volume change than properly sized sockets and necessitate more patient sock changes over the day . Thus, manufacturing errors that result in oversizing may inconvenience the patient. They may also influence socket longevity. Typically, a patient–s residual limb will decrease in volume over time, and the patient will add more socks to compensate. Once sock ply is excessive, more than approximately 10 ply, a new socket needs to be made. Socket longevity is reduced if the socket is oversized to begin with. The relationship between degree of oversizing and degree of reduction in socket longevity remains to be investigated. Understanding this relationship may improve cost management in prosthetics. MRE alone did not identify all sockets with problematic fit. Additional computed metrics were needed. This result points to the complexity of prosthetic fitting. This result might be relevant to modeling efforts to predict tissue response to changes in socket design [11–16]. The fact that the IQR metric picked up most of the sockets with sizing error that were not identified by the MRE criterion is consistent with our interpretation that IQR reflected a combination of sizing and shaping problems, which here we term –regional volume error.– A low MRE combined with a large IQR meant that, though the overall volume of the socket was good, the spread in radial error was high. In other words, at least one area of the socket was undersized and at least one area was oversized. The socket shape was distorted. We suspect that the practitioner identified these sockets as too big because of the location of the oversizing. All four sockets with MRE ≤ 0.25 mm and IQR > 0.40 mm that were deemed in need or sizing or shaping change were oversized on the anterior tibial flares and the posterior proximal region. Oversizing at these locations may have caused the subject–s residual limb to sink deep into the socket, giving the appearance of socket oversizing during static fit testing. Sockets from facility b may have consistently shown low MRE but high IQR (bottom section of Figure 6) because this facility had a consistent manufacturing problem. All of their sockets tended to be too large posterior proximally and on the anterior tibial flares but too small anterior distally. Because only six facilities were tested in this study, we do not know if this problem is unique to this facility or if a number of central fabrication facilities in the industry experience this limitation. However, in our prior investigations more than one facility demonstrated this kind of error [1–2]. Further studies testing more sockets from other facilities and more subjects will help establish if 0.40 mm is an appropriate IQR threshold for manufacturing acceptability. The result that companies may or may not have specific manufacturing problems points to the variability in quality in the central fabrication industry. Not all central fabrication is performed the same. The industry will improve as a whole if companies understand their specific manufacturing limitations and address them. Manufacturers of CAD/CAM equipment can facilitate this advance by incorporating tools into their products that allow customers to conduct evaluations of their socket manufacturing quality, similar to the assessment devices described here. Emerging technology, particularly high-quality, small-size imaging systems that allow inside socket shape to be accurately measured, may facilitate this advance. To be able to conduct the computational assessments described here, researchers need an instrument that accurately measures socket shape. The mean SNAE metric, unlike the MRE and IQR metrics described previously, mischaracterized some of the socket clinical fits (Figure 8). These mischaracterizations may have reflected measurement error in the proximal region of the socket where a different measurement instrument was used. An additional difficulty was the need to assemble data from two instruments (Provel digitizer; our custom digitizer) within this region. All four of the sockets with mean SNAE greater than 4.0?? but deemed clinically acceptable (lower section of Figure 8) had high SNAEs at the brim. It is noteworthy that brim errors were not sufficient to distort MRE or IQR calculations and interpretations, but they did affect mean SNAE. This happened because surface normal angle was a more sensitive measure to slight mismatches in shape than were MRE and IQR. Thus, while SNAE was a very sensitive measure and served well to identify local shape errors, it was detrimentally affected by digitization error at the brim. It is interesting that there are vertical lines within the SNAE plots for most of the sockets (left two panels of Figure 9(a) to (c) and Figure 10(a) and (b)), but these lines did not match regions identified clinically in error. Instead, closed contours of high SNAE matched regions identified clinically as in need of shape modification. Currently, the source of the vertical lines in the SNAE images is unknown. The lines could reflect our practice of correcting digitizer contact error in two rather than three dimensions . A more accurate representation of the surface may be achieved and presence of vertical lines in SNAE plots reduced if corrections were made in three dimensions instead. The finding that clinically detected local socket shape problems matched well with dense closed contours of SNAE (Figure 8, Figure 9(a) to (c), and Figure 10(a) and (b)) provides insight into the nature of clinically relevant shaping problems. A closed contour of high surface normal error is a regional distortion, i.e., a pushed-in or pulled-out contour on the socket surface (Figure 11(a) and (b)). This distortion is different from that of a line of high SNAE, which would be a ridge rather than a closed contour. Interface stresses will focus within the contour for the pushed-in case and at the perimeter for the pulled-out case. Because stresses for the pulled-out case are likely higher at the edge of the contour than within it, the pulled-out case may generate a sensation of excessive pressure at the perimeter of the region. Socket 8/c, for example, demonstrated this result. This interpretation may help explain why designing an acceptable socket shape is so difficult and how quantitative assessments as described here may facilitate understanding of the clinical manifestations of shape error. While one–s initial inclination for a patient voicing localized pain might be to relieve the affected area of the socket, if a pulled-out error resulting from poor manufacturing is the source, then relieving the area may worsen fit rather than improve fit. The pulled-out region should be pushed in so that stress is tolerated within the region rather than just at its perimeter. In a computational sense, this interpretation points to the importance of identifying high gradients of MRE rather than just identifying high MRE or high SNAE point locations. Locations of clinically deemed poor fit for sockets listed in Figure 8 were not necessarily at locations of high MRE or high SNAE, but were instead at regions where high SNAEs formed a closed contour. An interesting investigation would be to correct these regions using heat forming modification and then see if the clinical fit evaluation improves. It remains to be evaluated in a larger subject population whether the presence of contours of high SNAE is necessary to replace mean SNAE magnitude as an appropriate metric for local shape error. Stress concentrations for concave and convex socket shaping errors. (a) Concave (pushed-in) socket shaping error focuses stresses over surface of circular pushed-in region. (b) Convex (pulled-out) socket shaping error focuses stresses at circumference of pulled-out region. The capability of our computed metrics to match clinical fit assessments for so many of the sockets tested (Figures 3, 6, and 8) is an important milestone. These metrics should serve as a base for quantitative criteria for computer-socket manufacturing quality. More sockets need to be tested before clinically appropriate threshold values can be recommended for MRE, IQR, SNAE, or other criteria. It is also important to consider that some patients may have more relaxed metric criteria than others (young traumatic injury patients vs bony elder dysvascular patients, for example). Further research investigating subject dependence is needed. With a base of metrics established, we can pursue a number of relevant analyses to investigate the effect of controllable manufacturing variables on computer-socket manufacturing error. For example, how much do different polymers, e.g., ones that undergo much shrinkage versus those that do not, contribute to sizing error (MRE, IQR) or shaping error (SNAE)? Process variables can also be evaluated. For example, how sensitive are the metrics for cooling time to transport the socket from the oven to the model and apply vacuum. Do different technicians within a manufacturing facility generate different MRE, IQR, and SNAE results? It is our opinion that it is a matter of time before an imaging technology is developed to measure the inside shape of a socket with sufficient speed, accuracy, and sensitivity to be implemented in computer fabrication equipment and to be useful to prosthetic socket manufacturing evaluation. The prosthetics industry should anticipate this technology. Incorporating quantitative metrics into computer-socket manufacturing practice should allow the CAD/CAM industry to thrive, in part because using the data to reduce socket fabrication error should make computer-socket fabrication more cost effective than traditional techniques. Presenting manufacturing error information to practitioners should extend clinical capabilities, enhance judgment, and reduce time to effectively fit prosthetic sockets to patients. Properly indicating the nature of the error is a significant aspect of the algorithms developed in the research presented in this article. This feature should allow the technology to extend the practitioner–s capabilities in a manner not previous possible. The insight gained in this research into relationships between socket shape error and clinical fit might be applicable to the socket design stage of making a prosthesis. An interesting research effort would be to investigate relationships between socket and residual-limb shape differences (MRE, IQR, SNAE) and clinical assessment of socket fit. This insight may facilitate development of computational tools to extend and enhance practitioner CAD socket design efforts. An extension of the present study would be to investigate variable geometry sockets. Variable geometry sockets are a technology (e.g., Active Contact System, Simbex; Lebanon, New Hampshire) that allows socket shape to be altered to accommodate diurnal or long-term volume changes in the residual limb. We expect that variable geometry sockets will require the practitioner to set adjustment of maximum and minimum socket volume so that the socket is effective and safe for the patient. The alignment algorithm and computed metrics described in the present study are potentially useful because they should help investigators to determine if shape adjustments need to be made in specific regions or whether a global volume adjustment is acceptable. They should help determine what range of socket shapes is appropriate for a patient. An MRE greater than 0.25 mm was associated with clinical need for socket reduction. 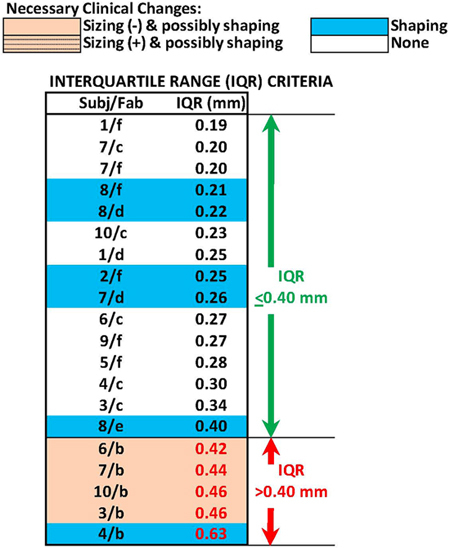 An IQR greater than 0.40 mm was associated with clinical need for sizing or shape modification. A closed contour of elevated SNAE was associated with clinical need for shape modification at the closed contour. MRE, IQR, and SNAE may serve as effective metrics to characterize the quality of computer-manufactured prosthetic sockets for people with transtibial limb loss. Study concept and design: J. E. Sanders, M. R. Severance, K. J. Allyn. Acquisition of data: M. R. Severance, K. J. Allyn. Analysis and interpretation of data: J. E. Sanders, M. R. Severance, K. J. Allyn. Drafting of manuscript: J. E. Sanders. Critical revision of manuscript for important intellectual content: J. E. Sanders, M. R. Severance, K. J. Allyn. Statistical analysis: M. R. Severance. Obtained funding: J. E. Sanders. Funding/Support: This material was based on work supported by the National Institutes of Health (grant R01HD069387). Institutional Review: We obtained human subjects approval from an internal review board at the University of Washington and obtained informed consent before any study procedures were initiated. Participant Follow-Up: The authors do not plan to inform participants of the publication of this study. However, participants have been encouraged to check the study Web site for updated publications. Check socket fabrication and fitting. In: New York University Post-Graduate Medical School. Lower-limb prosthetics. New York (NY): New York University; 1990. p. 89–91. Medicare region C durable medical equipment prosthetics orthotic supplier (DMEPOS) manual. Columbia (SC): Palmetto GBA; 2005. p. 53.5–53.6. Schnell MD, Bunch WH. Management of pain in the amputee. In: Bowker JH, Michael MW, editors. Atlas of limb prosthetics: Surgical, prosthetic, and rehabilitation principles, 2nd ed. St. Louis (MO): Mosby Year Book; 1992. Steege JW, Silver-Thorn MB, Childress DS. Design of prosthetic sockets using finite element analysis. Proceedings of the Seventh World Congress of ISPO; 1992 Jun 28–Jul 3; Chicago, Illinois. p. 273. Quesada PM, Skinner HB. Finite element analysis of the effects of prosthesis model alterations on socket/stump interface stresses. Proceedings of the Seventh World Congress of ISPO; 1992 Jun 28–Jul 3; Chicago, Illinois. p. 275. Silver-Thorn MB, Childress DS. Sensitivity of below-knee residual limb/prosthetic socket interface pressure to variations in socket design. Proceedings of the Seventh World Congress of ISPO; 1992 Jun 28–Jul 3; Chicago, Illinois. p. 148. Goh JC, Lee PV, Toh SL, Ooi CK. Development of an integrated CAD-FEA process for below-knee prosthetic sockets. Clin Biomech (Bristol, Avon). 2005;20(6):623–29. Submitted for publication May 31, 2011. Accepted in revised form October 11, 2011. Sanders JE, Severance MR, Allyn KJ. Computer-socket manufacturing error: How much before it is clinically apparent? J Rehabil Res Dev. 2012;49(4):567–82.